Snoring can effect either your own sleep pattern or disturb your partners, making any bedtime sleep routine a nightmare. Snoring is caused by the vibration of the soft tissue in your head and neck as you breathe in. When asleep the airways narrow and relax in your head and neck which is then thought that this narrowing increases the speed you breathe out which then changes air pressure in your airways. The cause of these changes make the soft tissue vibrate by sucking the sides of the airways in. Snoring can also occur when your suffering from colds or enlarged tonsils that result in partially blocked airways. Evidence has shown that snoring left untreated can result in snoring getting worse over time and can result in damage to blood vessels that supply muscles in the head and neck to become weaker. The vibrations from snoring weaken these muscles which result in their ability to keep your airway open. Obesity: If you have a large amount of fat around your neck and have a neck circumference of more than 43cm (17 (inches) usually snore a lot. Alcohol: Alcohol relaxes your muscles when you sleep, which increases the narrowing of your airways. Sedatives/Antidepressants: In some people, these medications can have similar effect to alcohol on the muscles. Smoking: Tobacco smoke can cause your airways to become inflamed, which causes greater narrowing of the airways. The inside of your nose becomes swollen and inflamed as a result of an allergic reaction to the substances such as dust or pollen. 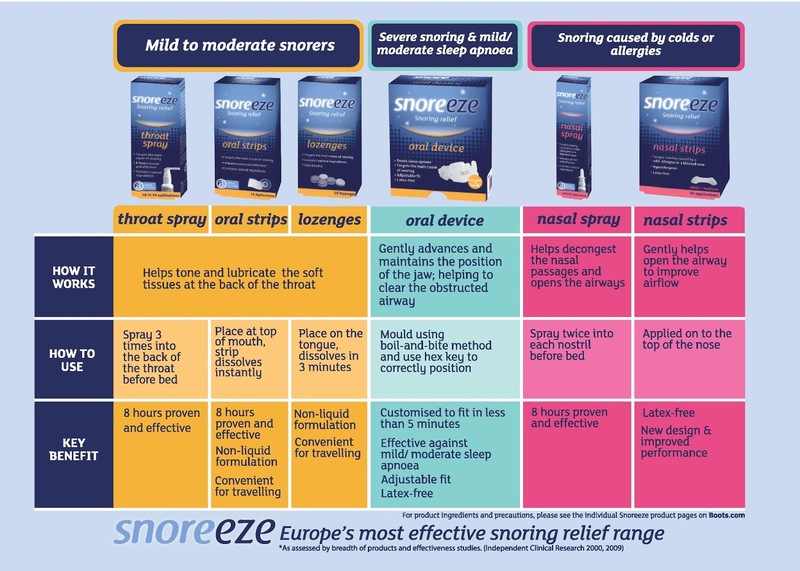 There is no guaranteed cure for snoring but Snoreeze offer many different products to relieve symptoms, to help you gain a more peaceful night sleep. Look at the chart below to help you decide which Snoreeze treatment would benefit you. 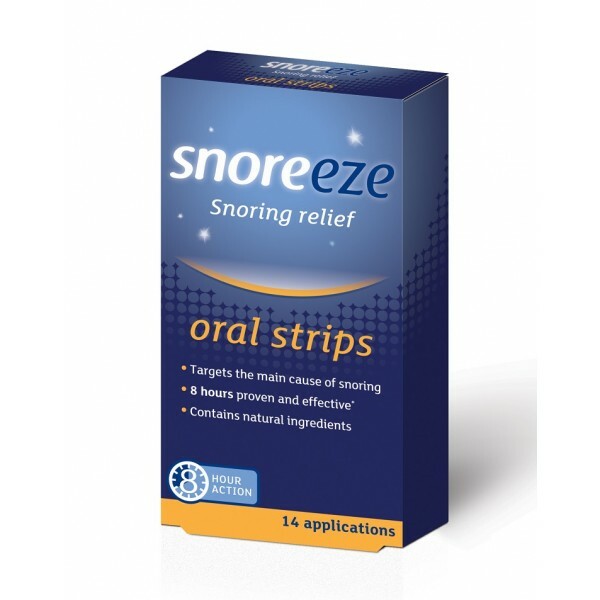 The Snoreeze Oral Strip targets the main cause of snoring and can provide effective relief for up to eight hours! The dual action, time-based formula lubricates and tones the soft tissues at the back of the throat to provide effective relief. Hyaluronic Acid, Guar Gum, Citric Acid, Blue FCF. Vegetal Origin. **A source of Phenylalanine. 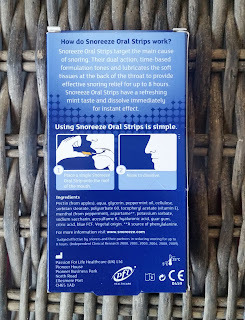 The oral strip is inside a sealed pouch with clear and easy directions to follow on the back. You take the oral strip out of its packaging and place one strip onto the root of your mouth. It is recommended for best results do not eat or drink after applying the strips in your mouth. 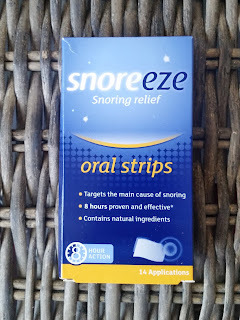 I was really surprised on how quickly these dissolve in your mouth and leave a pleasant minty flavor, which is great when using these just before your sleep time. 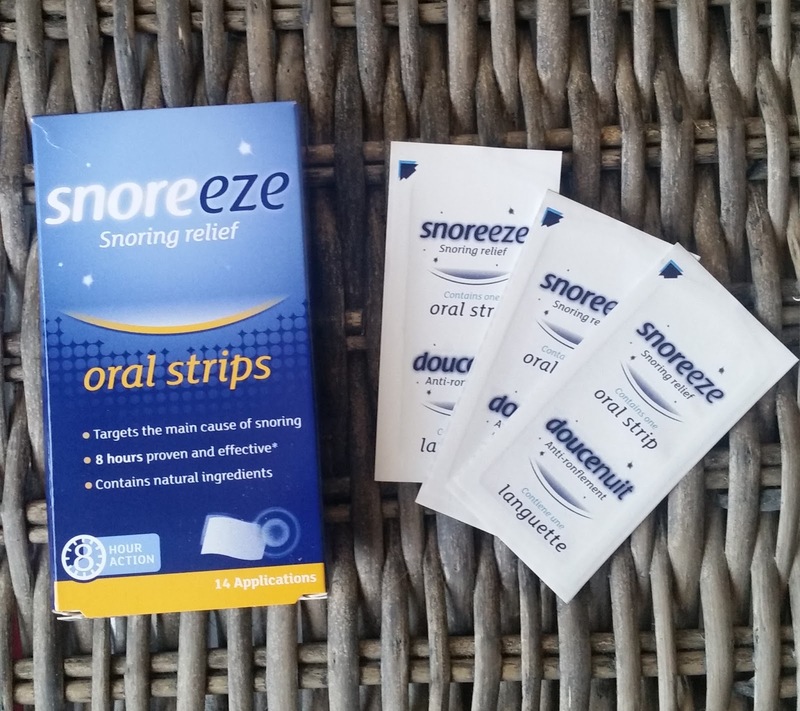 In the Snoreeze Oral Strips pack you receive 14 strips which is a 2 week course. 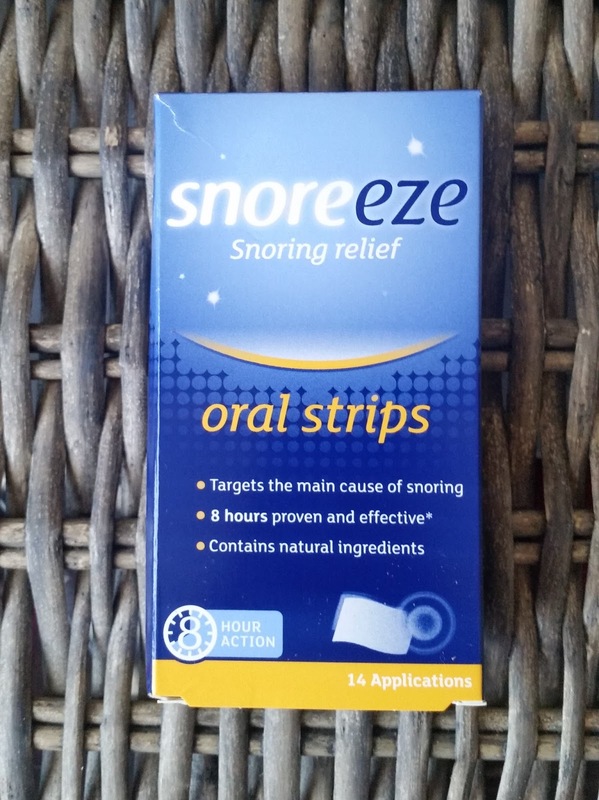 The strips are a quick and convenient treatment to use at night time and i have seen and felt a huge improvement when using these. I know when i have been snoring as i have woken myself up on rare occasions and also my throat has felt sore in the morning. 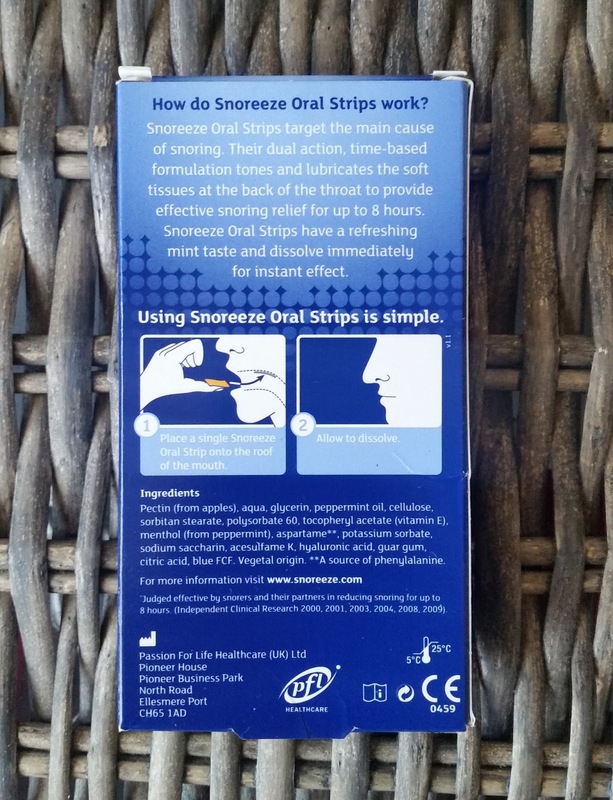 It is noted in the leaflet provided with the strips that the Snoreeze Oral Strips are not a cure for sleep apnoea (a related medical condition). You may be suffering from sleep apnoea if you stop breathing during sleep, wake-up tired or fall asleep easily during the day. It is recommended that you consult your doctor. Always read the leaflet before taking any product. 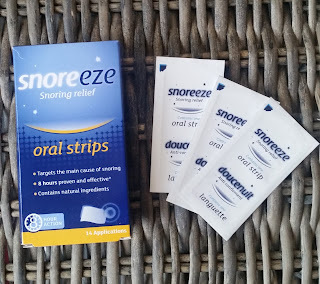 Thanks to Snoreeze for sending me their product to blog about! If your looking for a product and need some help head on over to Click Here Snoreeze website. Happy Sleeping! X Neil.